Pont (right) with Jolly in AU's Terrace Dining Room, or TDR. In high school, Cassidy Pont often felt sick and lethargic, until one day she changed her diet and realized she had food allergies. Now a senior in AU’s health promotion program, Pont is on the road to becoming a registered dietitian. Along the way, she wants to share the passion for nutrition that she discovered back in school. 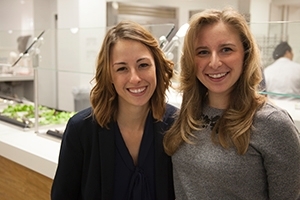 Using that same message and passion, Pont convinced AU Dining and Aramark’s on-campus dietitian Jo-Ann Jolly to create an internship for her to help in the many efforts aimed at making AU an increasingly healthier place. Their efforts come just as AU joined First Lady Michelle Obama’s Healthier Campus Initiative, which partners with universities around nutrition and exercise. Pont regularly collects nutritional data on TDR’s meal offerings to report to the organization. If you ask Jolly, though, she knows AU was fulfilling the wellness requirements well before the official arrangement. That’s due, in part, to students’ desiring more plant-based foods like fruits and vegetables. During the next year, the university will work to fulfill other parameters of the Healthier Campus agreement—including the installation of a walking trail to encourage exercise and the ability to rent outdoors activity equipment. Alongside representatives from the Wellness Center and Recreational Sports & Fitness as well as the library and Counseling Center, Jolly also sits on the university’s Wellness Committee, which guides these efforts. According to Pont, all this work really comes back to simply helping AU students succeed on campus and in the classroom. “When you’re fueled properly, you have the energy to study, do all the clubs and activities you’re in, and to really just go through your day with a better mindset while also physically feeling better,” she said. All the while, Pont is receiving valuable health promotion experience that she plans to take on to her career after graduation. In fact, what she’s already learned in the classroom and with Jolly has served her well in a recent internship with the National Institutes of Health. Still, Jolly sees AU as ahead of the pack in its participation in the First Lady’s Healthier Campus Initiative. For her, it’s all about AU’s student-centered approach. Looking back now on the tough times feeling sick in high school, Pont says she wouldn’t trade it for anything. It gave her the direction and drive to help others, like she’s doing now. “If I didn’t have that experience, I don’t know where I’d be, what I’d be studying, or what I’d be passionate about,” she said. And, for that, the entire campus can be thankful.